Ambiance owner Kannyn January may be the new kid on the block, but she certainly knows her way around retail. 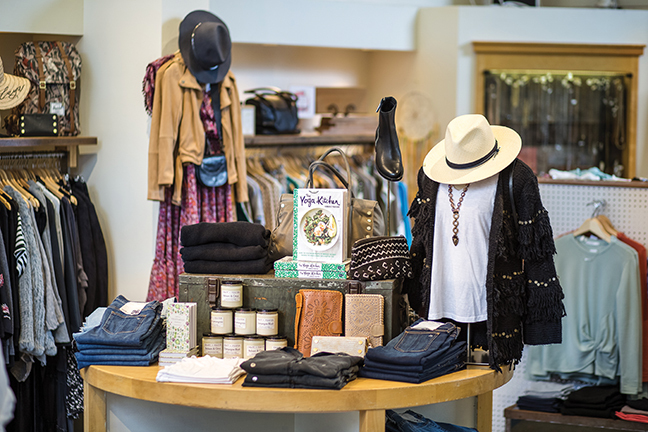 Since acquiring the original Ambiance boutique in San Luis Obispo in 2004, Kannyn has launched several additional locations - Ambiance in Paso Robles and Branded in Mill Valley. And fortunately for Santa Barbara area shoppers, the most recent in the former Blanka Boutique space on Coast Village Road in Montecito. Kannyn jumped at the opportunity to take this sweet spot over when Blanka owner Jennie Stierwalt decided to focus more attention on her clothing collection. The two have history together (Jennie used to manage the SLO store), and are excited to be working together again as Jennie is now involved in the buying and merchandising for the Ambiance brand. Like her other locations, Kannyn envisions the new locale as Montecito’s go-to for the fun, fashion-minded crowd and hopes to develop a real “come and hang out” vibe. The offerings are intended for women of all ages, sizes, and style preferences and include a mix of casual contemporary lines, with a sophisticated edge. All-star collections like Alice McCall, Hammitt, Mara Hoffman, Frame Denim, Calleen Cordero and many others are in the line-up. There’s also a tightly curated selection of home and lifestyle items - books, gifts, candles, body care, and other covetable goods that will get you in the mood to shop.